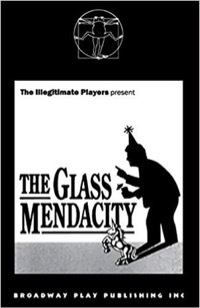 Presented in a staged reading by The Peter H. Luce Play Readers, The Glass Mendacity is an irreverent puree made from three combined and corrupted Tennessee Williams plays: The Glass Menagerie, A Streetcar Named Desire, and Cat on a Hot Tin Roof. Characters and relationships are amplified and shuffled. This farcical romp takes place in Belle Reve, home of the wildly dysfunctional Dubois family. Mayhem ensues as each family member attempts to lie, cheat, and swindle each other out of Big Daddy's fortune. Family members include Big Daddy and his wife, Amanda, drawn from Cat on a Hot Tin Roof, their certifiably crazy daughter Blanche, now married to Stanley from Streetcar Named Desire, and their painfully shy daughter, Laura from The Glass Menagerie. Completing the cast of mix-and-match characters is the brooding and silent Dubois son, Brick, and his conniving, vamping wife, Maggie from Cat on a Hot Tin Roof. Momentary sanity is provided by Mitch, a combination of the gentleman caller in Glass Menagerie and the suitor from Streetcar. The fast paced script snatches bits and pieces of famous lines from all three plays as characters collide and mendacity fills the house.